The Excel Option is a product from the QuickOPC family, while technically it is contained in the same installation package. 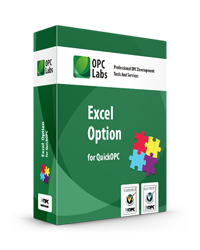 You can also easily combine the Excel Option easiness of development with all other options and features provided by QuickOPC, such as to add VBA code to handle more complicated tasks. It's easy to get started. Essentially, you just double-click the desired OPC data in the QuickOPC Connectivity Explorer application, and then drag the changing grid cell to your Excel spreadsheet. For step-by-step instructions, see Getting Started under Excel in the User's Guide. Individual points, or a selected set of points, can be read or written to. Point parameters can be edited before a subscription, read or write is made. Multiple points can be easily subscribed to at once, using the "Bulk Add" command. The live view can be turned online/offline with a single push of a button. Single cell, or any range of cells can be copied to clipboard and pasted to other programs. The currently displayed list of points can be saved to an XML file, or retrieved from a file. Various connectivity options can be configured, and the configuration can be in turn used when the same data is accessed by Excel. 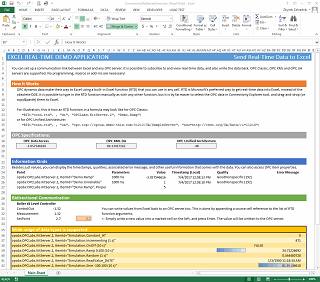 Excel Option for QuickOPC comes with a demo Excel spreadsheet that shows various features of the product (click on the picture to enlarge). You can use the demo spreadsheet to learn how to get most of the product. How It Works: Explains RTD functions and their syntax. OPC Specifications: Demonstrates data from various OPC specifications shown in Excel. Information Kinds: Values, timestamps, qualities, associated error messages, etc. Bidirectional Communication: How to easily write to OPC servers from Excel. Data Types: Wide range is supported, and the sheet shows examples of that. OPC dynamic data make their way to Excel using a built-in Excel function (RTD) that you can use in any cell. RTD is Microsoft's preferred way to get real-time data into Excel, instead of the obsolete DDE. It is possible to type in the RTD function manually as with any other function, but it is by far easier to select the OPC data in Connectivity Explorer tool, and drag-and-drop (or copy&paste) them to Excel. The RTD function addresses a so-called Connectivity RTD Server, a COM component that is part of the Excel Option, and this RTD server then performs the necessary communication with the data source.